A rare rainbow mussel (Villosa iris), listed as a Species of Greatest Conservation Need in New York State, was recently found in Moorman Creek, Monroe County. A YouTube video (http://www.youtube.com/watch?v=hxoMLCfhzUU) captures this mussel as it displays its lure to mimic a crayfish and attract a hungry fish. When the mussel feels a fish trying to take a bite, it releases numerous young mussels named “glochidia” that attach to the fish’s gills or fins. The unsuspecting fish provides food and aeration for the young mussels and a ride to a new home. Once the mussels metamorphose into juveniles, they drop off the fish and burrow into the stream bottom, and the fish swims away unharmed. 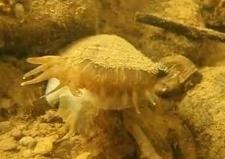 Watch a YouTube video (http://www.youtube.com/watch?v=hxoMLCfhzUU) of this rare rainbow mussel as it expertly mimics a crayfish.